The title of this post pretty much sums it up! If you’re looking for somebody to love, Orphans of the Storm® should definitely be your first stop. 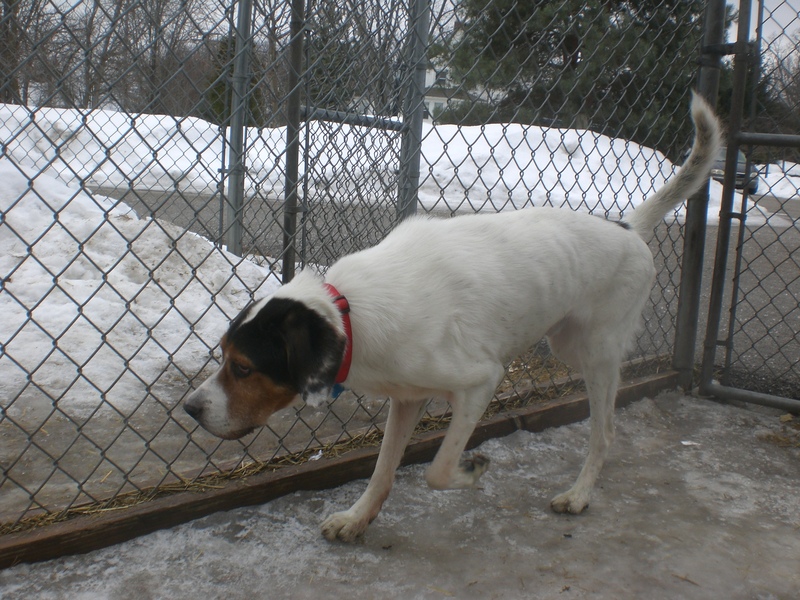 Fuzzy the ten-year-old Pointer mix is a calm, gentle soul. You don’t have to worry about any leash-pulling from this pooch; he would make a good walking companion for a trip around the block. Since he’s getting up there in years, Fuzzy doesn’t need quite as much exercise–but he certainly appreciated the chance to go outside for a bit and explore the off-leash run. Fuzzy is on the skinny side at the moment, so he probably wouldn’t mind getting a little spoiled with nice, tasty treats from his new family. He also wouldn’t mind getting spoiled with plenty of attention. He enjoyed getting a nice scratch under the chin and on his back. If you’re interested in a calmer dog who is just looking for friendship and a soft, warm bed, Fuzzy could be exactly the right dog for you! Reggie the two-year-old Labrador Retriever mix is such a pretty boy; he caught my eye right away as I walked through the shelter on this visit. Reggie was very polite while I put his leash on, and did a great job walking on our way to the off-leash run. When I stopped at one point, he just sat down next to me and waited. This is one dog who is all about pleasing people. 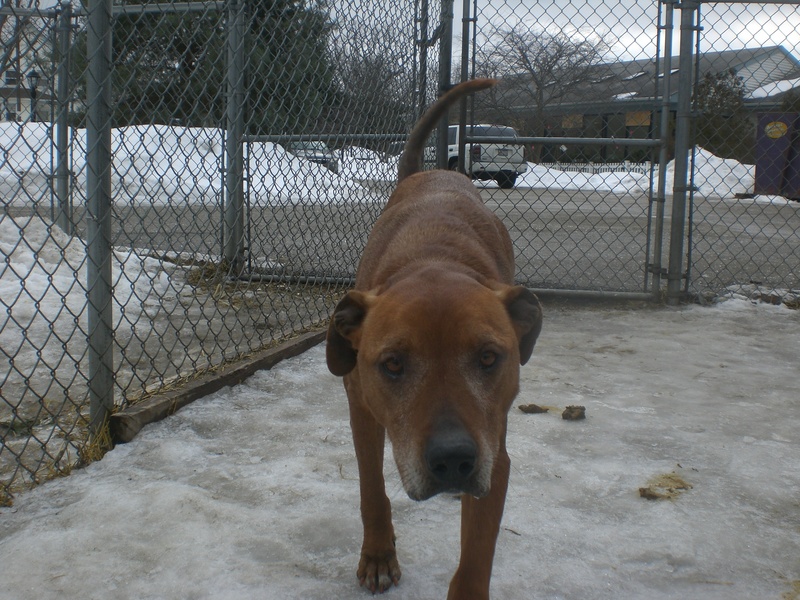 Reggie is (as the title of this post indicates) super lovable and super loving. If you want a dog that will give you plenty of hugs and kisses every time you come home, Reggie is more than up to the task. What a sweetheart! 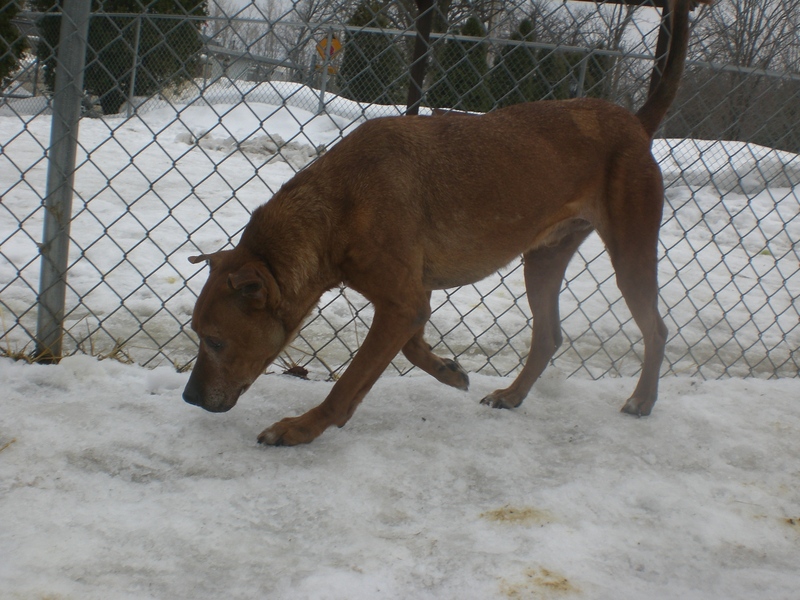 Also, Reggie is currently sharing his kennel with another pooch, so he could go to a home with or without another dog. 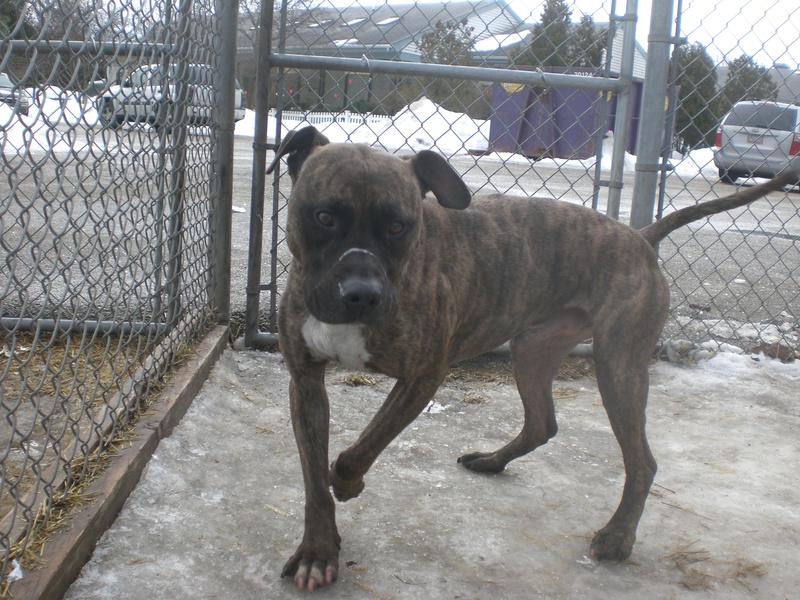 A dog like Reggie won’t stay at the shelter for very long, so come in soon to meet him! Reggie found a patch of ground with no snow! 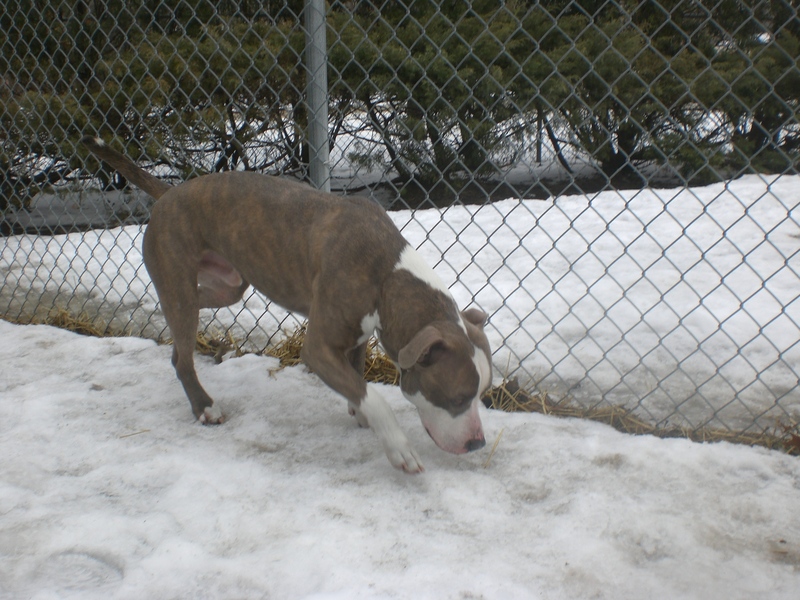 Luca the two-year-old Pit Bull Terrier mix is a volunteer favorite, and it’s easy to see why. This big, handsome boy is full of love and gets along with everyone he meets. Luca came from an owner who moved and couldn’t bring him along, so he has experience as a pet and gets along with adults, children, and other dogs. When I was out with Luca this week, he had four kids petting him simultaneously and he was enjoying every second of it. Luca knows a few commands, and I’m sure he’d be eager to learn more–especially for treats! He’s pretty strong, especially when he first comes out of his kennel and is excited to go for a walk, but he settles down and walks nicely on a leash after he gets the chance to stretch his legs. Luca loves to give doggy hugs and kisses, so if you’re looking for a big new friend who will shower you with affection, look no further than Luca! Javan the two-year-old Shepherd mix is such a happy, friendly guy. 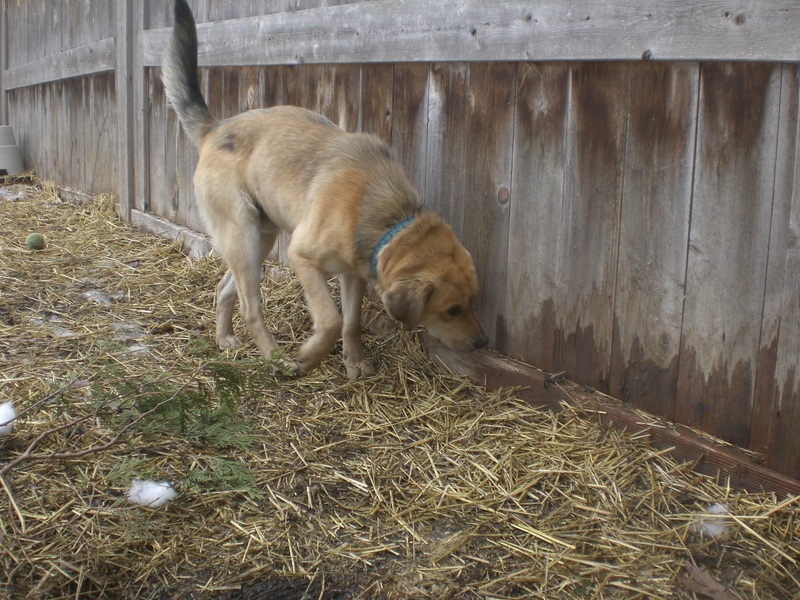 He arrived at Orphans of the Storm® with heartworm, but he has received treatment over the last couple of months and is now ready to find his new family. Javan is a real cutie (he looks like he could be Rusty‘s brother!) and has a wonderful personality to match. Javan just loves to cuddle. While he was off exploring the off-leash run, I decided to take a seat on the bench. When Javan looked up and realized this, he came sprinting over and jumped right into my lap (or, at least, as much of him as could fit). He may have had heartworm, but that hasn’t hurt his ability to love with all of his heart! I think it’s safe to say that Javan is one of my new favorites. 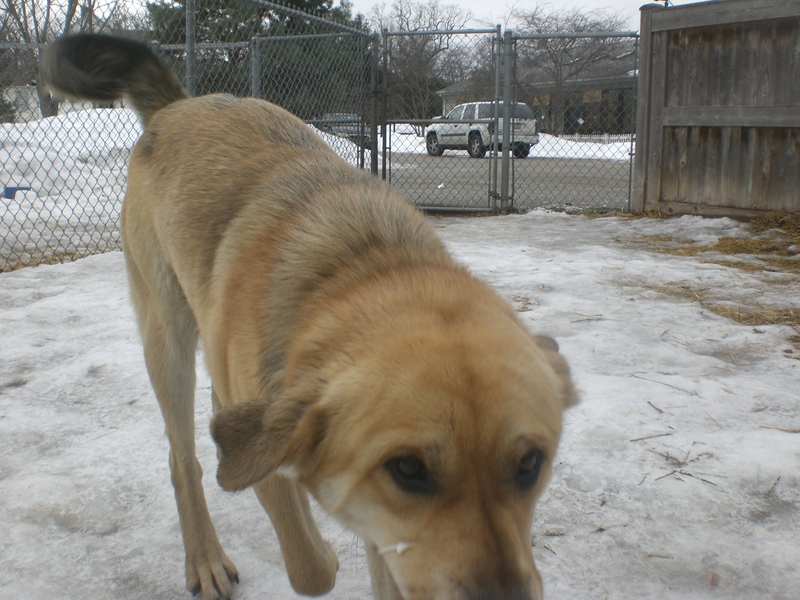 Come in soon to find out if Javan is the pooch for you! Tiger the seven-year-old Pit Bull Terrier mix is, like Luca, a dog who came from an owner who moved and couldn’t bring him with. That means Tiger has seven years of experience as a family pet, and can’t wait to show you what a great addition he would be to your family. Even though Tiger doesn’t understand how he ended up at the shelter, that hasn’t dampened his spirits; his tail is wagging constantly. Tiger has a face you just want to kiss! 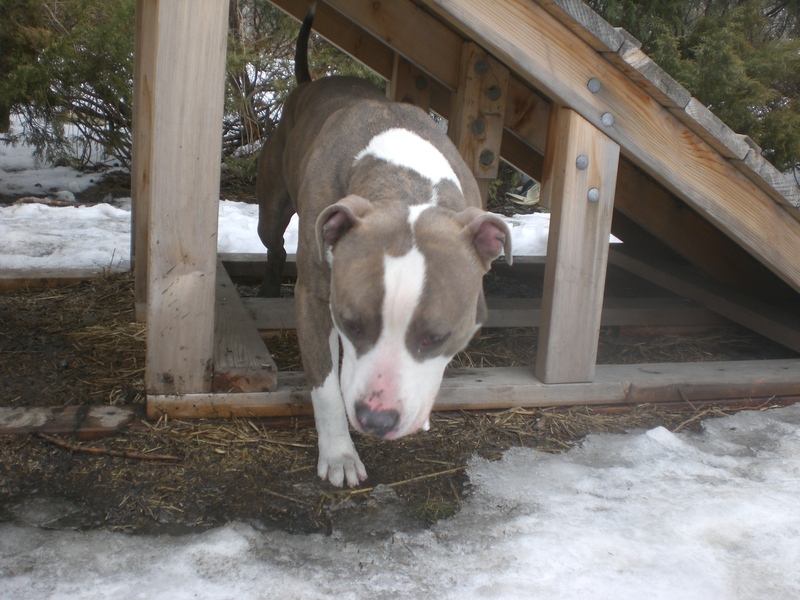 Tiger has another similarity with most of the dogs in this post: he loves to give doggy hugs. If you pat your chest, Tiger will gladly oblige and jump up to say hello. Is there such a thing as being too friendly? Tiger certainly doesn’t think so. He loves people and just wants to be loved in return. This good-looking guy has been passed over for far too long. 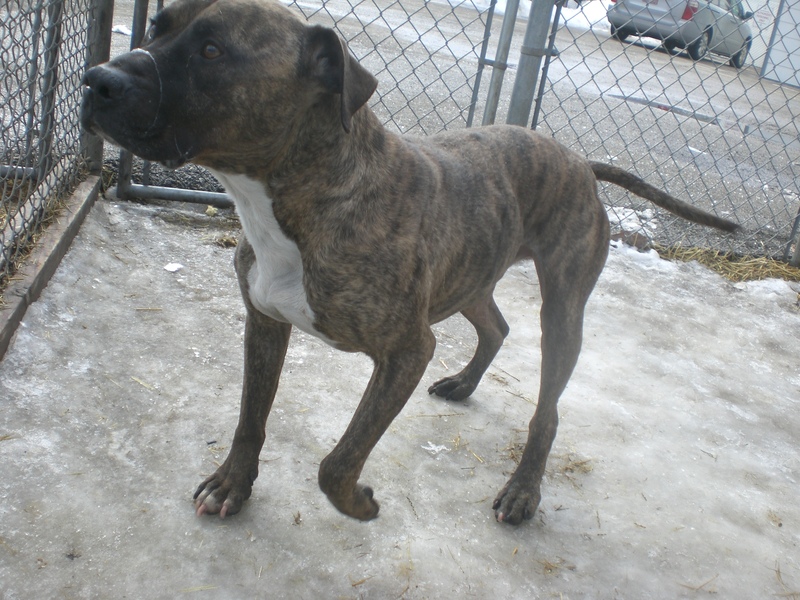 Give Tiger the second chance at a happy home that he so clearly deserves. Some other lovable pooches I spent time with this week are Jade, Saber, Buddy, Bebe, Wilbur, Giorgio, Lady, and Lucky. Also, who remembers Yeager? Yeager has been at Orphans of the Storm® for over a year, and now he has the opportunity of a lifetime: he’s the latest dog to be helped by Orphans of the Storm®’s Tyler Fund, which sends dogs who need some training for a stay at Tops Kennel in Grayslake. You can follow Yeager’s progress on the shelter’s Facebook page, and if you or someone you know is interested in Yeager, you’re highly encouraged to stop by his training sessions! 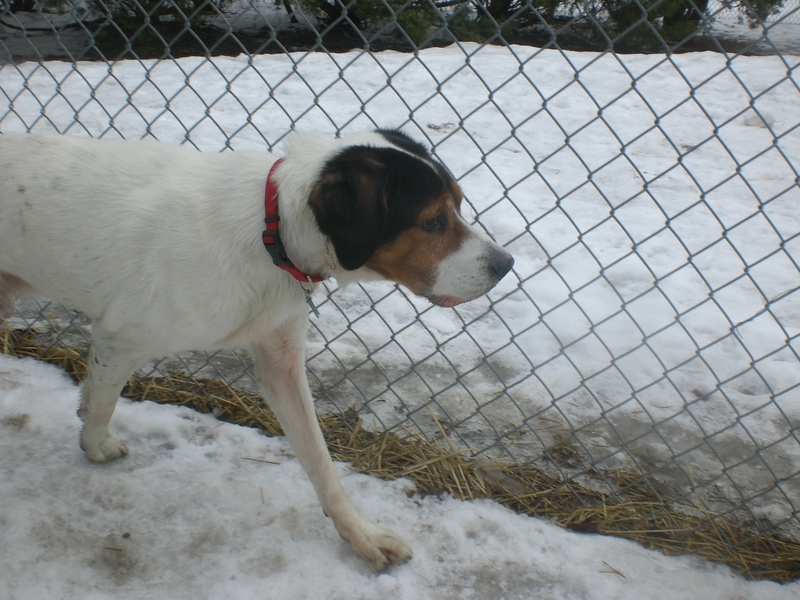 Although I didn’t get the chance to meet Tyler, the first Orphans dog to go through Tops Kennel, I certainly did know Buddy, who was happily adopted after his stay at Tops. Peggy, who graduated from Tops Kennel last year thanks to the Tyler Fund, is still waiting for her future family to find her. Posted by Meet the Pooches on March 13, 2014 in Dog Profiles and tagged adopt, adoption, animal shelter, animals, Chicago, dogs, Labrador Retriever, Orphans of the Storm, pets, Pit Bull Terrier, Pointer, Shepherd.